If you don’t have mad PhotoShop skillz or would rather not install new software – or all you need is a quick photo clean-up or a fancy effect on an image to jazz up your website, blog, or e-newsletter – here are three free online image editing tools you may want to get acquainted with. Aviary offers an astonishingly full-functioned suite of image editing tools, enough to meet the needs of even the most serious photo-artist. 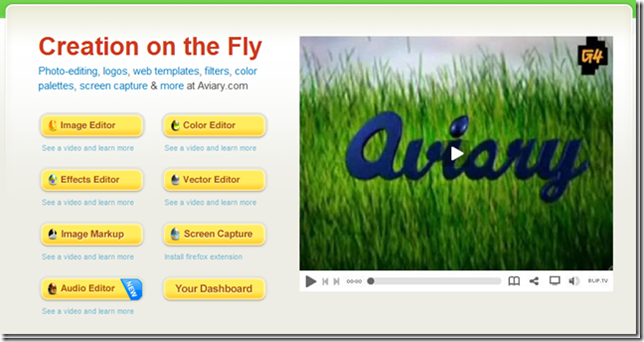 Aviary recently announced that their full suite is now free for everyone to use, including the Phoenix image editor, effects editor, vector graphics editor, color palette tool, and Falcon, a new markup tool that lets you annotate an image (with or without Talon, a companion Firefox screen capture add-on). At first look, Aviary tools can appear a bit much for those of us who found even Paint.NET’s learning curve a bit steep and just shake our heads at GIMP, but there are loads of tutorials to help you get the job done. When you can set aside a bit of time to explore Aviary, do yourself a favor and do so – you’ll be pleasantly surprised at how quickly you’ll get the hang of these powerful web-based tools. 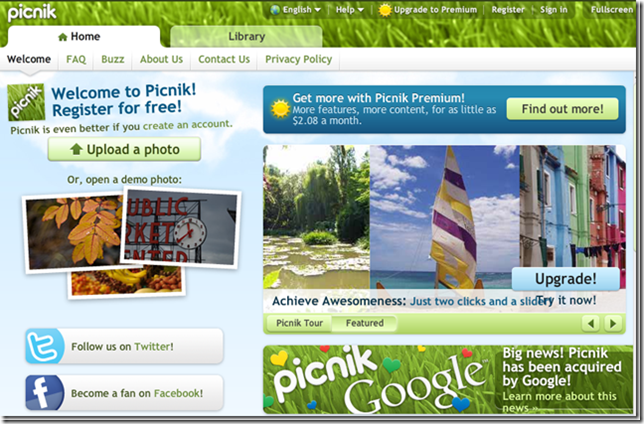 Picnik is perhaps the most easy-to-use of the three online editors here, with all the basic functions without the “overwhelm” of a PhotoShop-style toolset. And you can easily grab your images from Flickr, Facebook, MySpace, Picasa, or other sites where you might store photographs online. The focus is on making it intuitive to find and use the tools you need – playing around will teach you all you need to know. The real strength here is in all the the frankly fun effects you can quickly add to your photographs, from wacky “stickers” to artsy colorizations, from a simple frame to classic vignette style. 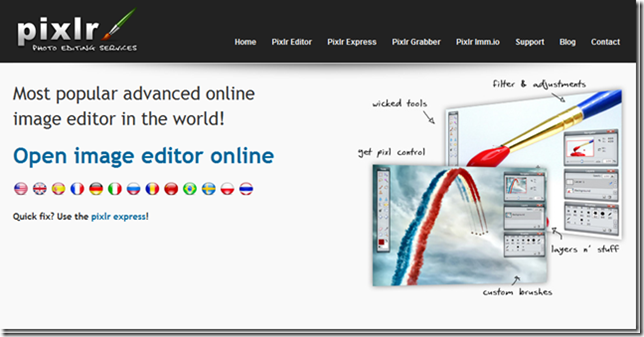 Some of the more “advanced” image editing functions in Picnik – like layers and red-eye correction – are restricted to paid accounts ($24.95/year) but the free version is more than enough for most purposes. I’d say that Pixlr falls somewhere in the middle between Aviary and Picnik, in terms of functions and the ease with which you can get up to speed – mostly because there are two different applications in the Pixlr kit. Pixlr Express is a simple image editor that takes care of the quick basic functions like cropping, rotating, sharpening an image, and so on. Use this for the quickk jobs, or if you’re just getting your feet wet in photo editing. And if you’re a Firefox user, check out the Pixlr Grabber add-on, similar to the Aviary add-on, that lets you make a screen capture (full page, visible screen, or an area you select), then save the image or edit it online with either Pixlr Editor or Express. Those are my current picks – what’s your favorite free online image editor? While the comparison to each other as free online tools is good, how do they really compare (ranking & opinion) to the better free down-loadable Image editing tool-sets such as Gimp, Paint.net, etc. you make only passing reference to them to compare learning curves and/or apparent difficulty. Do you have another article on the 'Downloadables' you can refer us to? @SDRitchey, my intention here was simply to focus on the top online tools that didn't require download/installation, and that don't have a steep learning curve. However, there's a detailed (3 page) review/comparison at Connected Photographer that should meet your needs: The GIMP vs. Paint.Net: battle of the free photo programs. Certainly those are the two main free PhotoShop alternatives, but for other software options see also 10 Excellent Open Source and Free Alternatives to PhotoShop at Six Revisions, a great blog for serious web designers. I use Aviary quite a bit, I actually prefer the Firefox plug-in for certain screen capture jobs over Snagit, which is regular desktop software. Its quite amazing how powerful these web-based tools can be! Rebecca - I love the Pixlr tool. I use photoshop a lot and agree that it has many of the functions that Photoshop has. The value of these online tools is that a distributed staff can edit an image by sharing an account. "The value of these online tools is that a distributed staff can edit an image by sharing an account." -- great point, John! Pretty good alternatives to using a program such as photoshop. I really cannot afford to run photoshop on my netbook so these come in handy so I can edit photos for my blog when on the go. Pretty good list of editors you can use via the web! I think PhotoDekho's online photo editor might be a good addition to it. I use photoshop every day because it is the tool that I need for professional photo editing, I think these online editors are great and ideally positioned for the casual user who just needs to make some minor adjustments, without the steep learning curve and cost. I dare say we will see more of these applications as cloud computing growes.